Vrishbhan asks Radha to climb mountain and get soil to prepare Shivling from it. Thunderstorms start. Radha climbs mountain bearing thorns and other hurdles. Krishna tells Mahadev/Batuk that Radha is bearing hurdles and climbing, she will prepare shivling for sure. Radha reaches mountain top drenching under rain and gathers soil thinking she will drop her jealousy and handover Krishna to Chandravali after she will return down with shivling. Her tear drops fall down into rain water and turn into pearls. Krishna says Radha sacrificed her jealousy and her tears turned into pearl of love. He picks pearls and hands them over to Mahadev to give it to sister Gowri. Mahadev realizes what Gorwi mata meant by pearl of love. Krishna says now his Radha is free of jealousy now. Radha prepares coarse shivling and comes down. Krishna joins her to complete shivling with painting and tilak. Balram tells Mahadev that Krishna fulfilled his promise and prepared maha shivling with Radha. Mahadev says Radha and Krishna’s love will be remembered forever. Radha and Krishna paint shivling and apply tilak on it. Ugrapath performs pooja. Krishna tells Mahadev it is time to get back his powers. Mahadev gets back is powers from shivling. Radha searches Krishna. Ugrapath says climate has calmed down, it means Mahadev’s anger also has calmed down. Krishna thanks Mahadev for his help. Mahadev asks if he will not call Gowri here. Krishna via telepathy calls Gowri to come on earth and purify it on Mahashivratri. Gowri asks if he wants to see his sister. He says he wants to unite his energy with Mahadev’s. Gowri agrees. Krishna says it is time to meet Radha now. Radha searches Krishna. Krishna meets her. Radha says he can be with Chandravali. He stops her and says Batuk’s wife Gowri has come here and she needs to sort out Batuk and Gowri’s differences. Radha agrees. Mahadev calls Gowri to come on earth now. She emerges as a common woman and says she is here. He says at last she came to meet him. She says she came to meet her brother Narayan and Radha. Krishna walks in with Radha. Batuk introduces his wife Gowri to Radha. Radha greets her and says Batuk means Mahadev and his wife is just like devi Gowri, they both look like Mahadev and Gowri and are made for each other, so Gowri ji should not fight with Batuk as he loves her a lot. Gowri says even Krishna loves Radha. Radha says Krishna loves Chandravali. Gowri reveals that Krishna loves only Radha and did this drama with Chandravali to free Radha from jealousy. Radha asks Krishna if it is true. Krishna says let us reunite Batuk and Gowri first and they both perform Mahadev and Gowri’s marriage..
Krishna gives moral gyaan that they try to do good for dear ones most of the time and select a best gift for them, some select clothes and some select jewelry; even previous clothes fade and tear and jewelry break, so best gift is giving a valuable time to their dear ones. Precap: Krishna gifts Radha. Kans orders Jatila and Ayan to kill Vrishbhan. Krishna gets concerned for Vrishbhan hearing that. 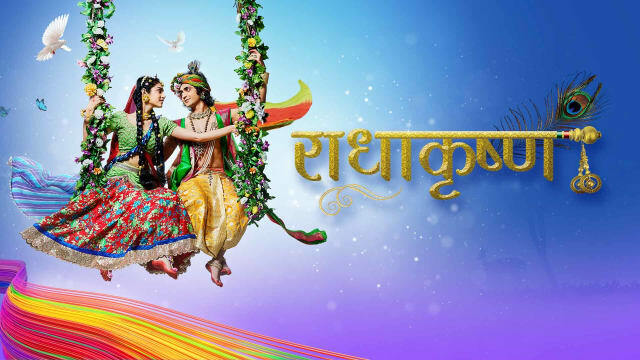 The post RadhaKrishn 11th March 2019 Written Episode Update: Radha Is Stunned appeared first on Telly Updates.